- What happened to the endowment lands? - What non-leasehold endowment land is left? - Was Waitara East also confiscated, or was it purchased fairly or otherwise? - Are leaseholders correct when they say Te Atiawa has already received compensation in the 1940s? - Why was the Head of Agreement signed one day before the Deed of Settlement? - Is the Heads of Agreement with Te Atiawa more than a list of issues to be discussed? Chester Borrows: [The Maori Affairs Select Committee] particularly has always worked on a consensus and so we very rarely have a vote on anything. We may state different views on it, but generally the work of the committee goes back uncontested and I don't recall having a vote on that committee, which is really important. And there is no government majority on the committee either, so its a consensus-driven, committee and so it should be. ... And the record can show that there was disagreement on the committee, and everyone can vote that it was a true record of what was said ... so you don't necessarily need to have a big stoush over everything. Taranaki Tuturu, Te Atiawa, and Ngaruahine yesterday received the remainder of their financial and cultural redress, bringing to an end this stage of the treaty settlement process [...] Despite the formal part of Te Atiawa’s settlement being completed, members have a sense of unfinished business over the Pekapeka Block in Waitara. Patsy Bodger reviews the Maori Affairs Select Committee NPDC (Waitara) Land Bill submission hearings that were held at Owae Marae last Friday. Liana Poutu, chairwoman of Te Kotahitanga o Te Ātiawa says a reconciliation process similar to that for Parihaka offered a way forward: "I don't think it is something we pick up and dump here and replicate but what it shows and indicates to me is that this can be dealt with outside of Treaty settlements and it can be dealt with outside of legislation and we need to take some time to explore it." Peter Moeahu: "We look to you our Political All Blacks we ask you to search your heart of hearts and ask yourself what is the right moral and just thing to do. What is the right moral and just thing to do? There can only be one right answer that is to return the land to tangata whenua. Mr Chairman, this may be done at the time of the Taranaki Maunga settlement by inclusion in that bill provisions to remove the endowment from the Waitara land and return it to tangata whenua ensuring the leaseholder rights are protected are guaranteed under that transfer provision. In the meantime let’s kill bill." Awhina Cameron, chief executive of Tu Tama Wahine and a member of the Taranaki Maori Women's Network, tabled a petition to the select committee during her submission.The document, signed by 2340 people, calls for all MPs to challenge and vote against the bill and asks for the council and government officials to get back around the table and come up with a better solution. Manukorihi Hapu Chairperson Patsy Bodger rejected the bill and said the bottom line was that the land should be returned. "If the land is not returned it will only perpetuate the grievance that exists to this today and our tamariki and mokopuna will be left to continue the challenge to have the stolen lands returned. We want our lands back so that our whanau and our community can start healing and build towards a positive future." The iwi says the final bill is not in the best interests of Te Atiawa. It believes significantly more Waitara land should be returned and that the bill should provide solutions that have a less polarising impact on the local community. It also says it would like to see the bill recognise the truth about the Waitara land confiscation. Only one of the 14 submitters in the morning session, a Pakeha lessee, spoke in favour of the bill, while other Pakeha lessees supported the iwi position. in Wellington on Wednesday 15 February 2017. NPDC: The Council is not the Crown and is not a Treaty settlement partner. The established law is clear that land vested in a local authority, such as the Waitara land, is private land and not available for inclusion in settlements. To separately legislate to require NPDC to transfer all of the confiscated Waitara land to iwi would be inconsistent with this established approach. Te Korimako O Taranaki and Radio Waatea will be providing visual and audio live coverage. If you would like to be involved or further information, please email owaemarae@xtra.co.nz. Rawiri Doorbar says Otaraua's bottom line is still the return of the whenua that sparked the first Taranaki War in 1860, but the bill makes that an even more distant possibility. Full Interview here. About 50 volunteers turned out for a working bee at Waitara's Owae Marae on Saturday to spruce up the place ahead of what is a busy month at the pa site ... which will include the Maori Affairs select committee hearing which will be held on Friday regarding the New Plymouth (Waitara Lands) Bill. It is not a complex issue. Any child knows the common-sense fair go that says if you steal something, then you should give it back. The dispute over the Waitara Lands is only complex when you are able to come up with 1001 ways of avoiding this common simplicity. The takeaways [from his Waitangi Day speech] were provocative. First, have we ever before had a National Party prime minister who speaks so unequivocally in support of Māori agency – and of Māori activism that lays the foundation for Māori agency? Second, if the Bastion Point protest was historically invaluable, what does that say for other protest movements today – inside Māoridom and more widely? Andrew Judd's message for Waitangi Day 2017: Challenge the thoughts that have been planted in you, all the myths presented as facts – truly challenge them. Get onto a marae and look into the eyes of Maori. It wasn’t reading a book that changed me, but seeing and speaking to real people in their environment. I’m not trying to be a Maori, because I’m not one. But we have to stop this cycle of ignorance. We haven’t confronted our past as Pakeha. I feel lied to and robbed of that knowledge, because I wasn’t told it at school. It’s not about blame, because that’s history. It’s about finding a way to move forward. But it will be a generational shift and it will take time. The New Plymouth District council has done an about face and apologised after attempting to force 12 Waitara leaseholders to pay increased rents by approaching their banks for the money. Te Atiawa declined to buy the land back, at a cost of $23 million, as part of its Treaty of Waitangi settlement deal. It chose instead to enter into a non-binding Heads of Agreement with NPDC to draft a local bill to present to Parliament as a means to try and resolve the issue. Initially, the bill had the backing of Te Atiawa but it had since changed its mind. In its written submission, it asked the NPDC to either withdraw the bill or for the select committee to refuse to support it. Te Kotahitanga o Te Atiawa chairwoman Liana Poutu said the iwi deserved to have more land returned to it and the level of discontent among its members about the bill had also been a factor in its decision to withdraw support for it. In their submissions, Manukorihi and Otaraua hapu have also voiced strong opposition. [...] The NPDC have said they are bound by legal and fiduciary obligations that are set out in the Local Government Act 2002 and in common law. from David Rogers, Chairman, Manukorihi Pa Reserve Trustees: "With the first Hearings of submissions being heard at the New Plymouth Novotel in December 2016, Nuk Korako, Chairman of the Maori Select Committee, graciously accepted the Trusts invitation to hold the second round of hearings at Owae Marae at Waitara on the 17th February 2017. The Third and final hearings will be received in Wellington at a later date." The New Plymouth District Council has spent more than $400,000 on consultants drawing up a bill aimed at resolving historical land issues at Waitara, which Te Ātiawa has rejected. Chief executive Barbara McKerrow said the council had spent $435,000 on legal, survey and valuation advice since work on the Waitara Lands Bill began in 2015.In addition, Ms McKerrow said the bill had been a significant project for a number of council staff, but she could not put a price on this. Taranaki heritage sights such as this one in Waitara will be part of a new app tour of Land War sites set up by Heritage Taranaki. Kennedy Warne: Is sorry enough? Crown apologies are a standard feature of Treaty settlement legislation, but they are not token statements of regret. Rather, they contain frank and moving admissions of past transgressions, and promises of future relationship-building based on honour and respect. [...] The purpose, clearly, is to bring psychological closure to a traumatic history and establish the conditions for future trust ... But is saying sorry enough? Labour’s Tamaki Makaurau MP Peeni Henare is challenging his fellow MPs to show up for treaty settlement bills. This week’s special sitting to pass the Te Atiawa, Taranaki Tuturu and Ngaruahine settlements drew hundreds of Taranaki people to the galleries but only a smattering of MPs to their green leather benches. Hundreds of people from Taranaki travelled to Wellington last week to see the third and final reading of three iwi treaty settlement bills. Tribal members filled the public gallery of Parliament as representatives of Ngāruahine, Te Ātiawa and Taranaki Tuturu sang songs and performed a poi and a haka as the bills were passed, giving legislative effect to their settlements to address the historical injustices inflicted on their people. Nanaia Mahuta MP: This is the first time in any Treaty settlement debate that I have made any contribution on where I have a real sense of concern, and where I need to call on the moral fibre of the character of each of us as decision makers and as leaders to ask the question: have we got it right? ... I feel that there is one matter outstanding, which has not been addressed and must be, and it is the Pekapeka Block. The third and final reading of Treaty of Waitangi settlement bills for Taranaki, Te Atiawa and Ngaruahine iwi groups will take place in Parliament. The historic day also marks the beginning of a new chapter for each iwi. Allowing for compensation to be granted by one bill and returning the land under another bill would be seen as double compensation and would probably set other iwi off around the country coming back to the government trying to get the same terms and conditions as Te Atiawa would enjoy.This would be like a red rag to a bull to the New Zealand public who have believed the settlements are supposed to have been 'full and final'. Te Kotahitanga Trustees engaged with NPDC in good faith to work through the high level principles upon which the proposal for the Bill had been developed. However, it was clear from the outset that there were significant limitations on what Te Kotahitanga could achieve through this engagement, as a decision by NPDC as to what land would be available for transfer has been made prior to the Heads of Agreement being signed. [...] The decision of Te Kotahitanga to oppose the Bill, following good faith engagement with NPDC on its high level principles, was not a decision made lightly. As such, our submission sets out our views based on the following rationale: A. Te Atiawa people deserve to have more land returned; B. The Waitara community deserves certainty and prosperity; and C. New Zealand deserves to know the truth about Waitara. Te Ātiawa has withdrawn its support for a bill designed to end one of the longest and most bitter land disputes in New Zealand. [...] It said the bill was not in the best interests of Te Ātiawa, and iwi members and Waitara hapū members were overwhelmingly against it. The iwi said the original non-binding Heads of Agreement with the district did not allow it enough time to consult with iwi members and it was not directly involved in the drafting of the bill. Its preference was to have more land returned, but the council determined what land was available for transfer, it said. Te Ātiawa said it made submissions to council when it was publicly notified, but most of the amendments it suggested were not adopted. Te Kotahitanga o Te Atiawa chairwoman Liana Poutu said the bill was not in the best interests of the people of Te Atiawa. [...] Poutu said the iwi deserved to have more land returned to it and the Waitara township as a whole should have "certainty and prosperity." She said the level of discontent among iwi and hapu members about the bill was also a factor. Many from within Te Atiawa have called for the land to be returned, with no price tag attached. 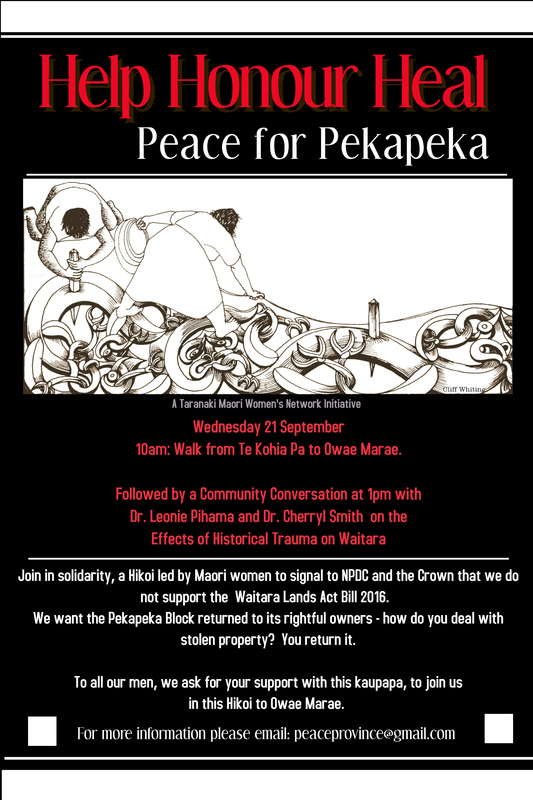 In September, a Peace for Pekapeka march was organised by the Taranaki Maori Women's Network as a show of opposition to the bill. The Maori Affairs select committee has done a u-turn on its decision to exclude Waitara as a venue for a public hearing about a controversial land bill. The committee announced there would now be two hearings about the New Plymouth District Council (Waitara Lands) Bill - one in New Plymouth this Friday and another in Waitara in February next year. Rawiri Doorbar: "I am just "I'm just dumbfounded. There's no reason why it couldn't have been held in Waitara. The whole matter is all about our community." Patsy Bodger says no booking had been made at Waitara's Owae Marae, a place which is arguably Te Atiawa's most important meeting point and a site closely connected to the confiscated land at the heart of the proposed legislation. While this Bill provides for approximately 45 per cent of the endowment land to Te Atiawa, either through direct vesting or by rights of first refusal, and co-governance of the proceeds of the remaining lands, and that Te Atiawa negotiators declined the uptake of the leasehold lands in their Treaty settlement, some in the community have called for the return of all endowment land to Te Atiawa and, in particular, the hapū. This reflects that it was confiscated land and should therefore be returned. To do this would be inconsistent with the Council’s wider statutory obligations regarding prudent financial conduct. Irrespective of how the Crown acquired the Pekapeka Block, endowing it on the predecessors of the Council was a legal act and the land is an asset in the Council’s books. The logic behind statements that the Council is the receiver of stolen goods and should give them back could apply to endowments granted to local authorities, universities, health boards, and various other public bodies all over New Zealand. Similar land will now likely be held by and in the books of other related entities such as port companies (some of which are privatised and even listed, but still Council controlled). If the concept is valid, it should apply to all endowments, or indeed even sales for value, by the Crown of land taken or purchased unfairly from Māori by the Crown, but to require forfeiture of what is now regarded as private (i.e. non-Crown) assets would cut across one of the key principles of Treaty settlements. Further, the bona fide receiver of the land (which did not even exist when the Crown took the land) would be entitled to look to the Crown for compensation. NZ Geographic: Why Wasn't I Told? Grant Knuckey: "This is the final opportunity to have a say on the controversial piece of legislation. This is it to me. This is possibly the final settling of this particular matter." Judd called out Prime Minister John Key, to speak out about how Maori partnership has proved to be beneficial, including within his own coalition government with the Maori Party. The public now has the opportunity to have its say on the Waitara Lands Bill which is being considered by Parliament's Maori Affairs Committee. It was the eve of the 1999 election. In secrecy, in the office of the Treaty negotiations minister, Sir Douglas Graham, with no announcement, no speeches and no waiata, two representatives of Te Atiawa signed the iwi's draft Treaty settlement. A new precedent for hapū settlements? The government has always negotiated treaty settlements with large natural groupings, but recently Minister for Treaty Negotiations Chris Finlayson accepted changes to the Ngāpuhi settlement, which could see a settlement split six ways, with hapū the driving force. New Zealand First leader Winston Peters said Ngāti Aukiwa had claimed Stony Creek Station should be returned to its hapū, not the whole iwi as the settlement bill required. Mr Peters says one of his main objections is to a provision in one of the bills that allows for Maori representation on local councils. Winston Peters says aspects of the bills need to be debated, including the one settling the claims of Ngati Kahu ki Whangaroa in his Northland electorate. Peters: "All of the iwi is going to get what belongs to one hapu in Whangaroa. That is wrong. It is wrong in Maori law, it is wrong going back centuries in the way we see things ..."
Taking a walk on land confiscated from tangata whenua provided Taranaki people with a chance to show their unity against a controversial piece of legislation. The Peace for Pekapeka march left Te Kohia Pa in Brixton on Wednesday morning and as the 200-strong hikoi made its way through the Waitara township, waiata was sung by young and old. Jocelyn Millard: "The people who lived on this land were literally not just walked off, they were paraded off at the end of a gun, and we're coming back to say 'no, the land still belongs to mana whenua'. There are hapū here that have lived here from the beginning and the land needs to go back to them. Just give it back." Jocelyn Millard: "They didn't pay for this land, but they've gained a lot of income over the years through the leaseholds, so there isn't any loss of money by giving it back." The New Plymouth District Council is being accused by some Waitara Māori of selling off stolen land through the Waitara Lands Bill, being read in Parliament tomorrow. The bill will allow the Council to sell off Waitara land leases. It was opposed by just one councillor, Howie Tamati. Manukorihi hapu chairwoman Patsy Bodger: " We have not changed our stance in 156 years. We just want the land back. We have never wanted money, we have never wanted anything else, we've just wanted the stolen land to come back to its original owners." Taranaki waahine have called a protest march in Waitara tomorrow demanding the return of the land to the iwi. Labour MP Louisa Wall says the issue has generated considerable debate at council level, and now it’s a chance for parliament to consider those submissions. "The Waitara Land Grab of 2016 — some thoughts on Peace for Pekapeka"
So how is it, after 40 years of progress with apologies and settlements following the 1975 Maori Land March, that the Taranaki councils and our government are still planning to sell the Waitara lands over which the Taranaki Land Wars of the 1860s first broke out? And how is it that this can still take place over the very clear protests of the tangata whenua who had their land stolen? "Hikoi planned to show solidarity against proposed Waitara land legislation"
Taranaki Maori Women's Network: "We hope to create a space for a new conversation to address some challenging issues within our communities, encouraging profound dialogue which is focussed on healing and social justice." As the bill makes its way through the parliamentary process, there is still unrest from stakeholders around the bill. The bill is widely seen as a compromise between Waitara leaseholders, who want the opportunity to buy their land freehold, and local hapu - many of whom believe the land should be returned to Maori. "The New Plymouth District Council (Waitara Lands) Bill 2016 is likely to be introduced to Parliament this week." "Stolen Land and Healing Historic Trauma"
NPDC Policy Adviser Greg Stephens speaking on the Waitara Lands Bill. Awhina Cameron speaking on stolen land and healing historic trauma. "Te Atiawa 'blood money' accusation"